The Mauser Model 1910 in 6.35 mm Browning was by any measure a remarkably successful pistol, but the 6.35 mm Browning cartridge was originally designed for the smallest of personal protection pistols (known as vest pocket pistols) and, as the end of World War I drew near, the Mauser company decided it was time they manufactured one. 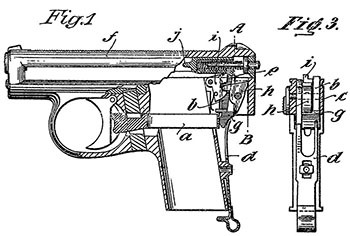 Weaver, Speed, and Schmid, in their book Mauser Pistolen, state: “Instead of designing a new pistol, Mauser simply bought the rights to an existing simple blowback design, with a barrel removal system patented in 1917 by a company owned by a C E Heinzelmann of nearby Plochingen am Neckar...” They reference Hogg and Walter’s Pistols of the World, which states: “Heinzelmann made the Heim pistol, a 6.35mm blowback automatic that externally resembles the Mauser WTP, but internally, is closer to the Browning 1910 with a fixed barrel and a coaxial return spring secured by a muzzle bushing. It carries the company’s name on the slide and appears to have been made for a short time in the early 1930s.” The Heim pistol does not use the same barrel removal system as the Mauser WTP. The patents for the Heim pistol were filed in 1924 and granted in 1926, but none bears any relationship to the Mauser WTP. 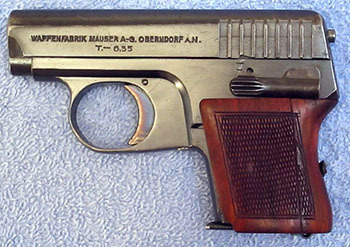 Mauser Pistolen is the only source that references Heinzelmann in relation to the WTP. WTP is the abbreviation for Westentaschenpistole, or vest pocket pistol. There are two distinct types of WTP, known as the WTP I and the WTP II. The WTP I was made from 1921 through 1937 or 1938. Most sources state that the WTP II was first made in 1938, though the 1937 Geco catalogue already has it listed. It appears to have been discontinued before the end of 1940 due to Mauser’s need to fulfill military contracts during World War II. We have been unable to locate the patent for barrel retention, possibly because it is not under the Heinzelmann name (Weaver, Speed, and Schmid state it was patented by a company owned by Heinzelmann). We would be grateful to anyone who can locate this patent. Klaus-Peter König and Martin Hugo, in their book Taschen Pistolen, state that the WTP was patented in 1918--we assume they mean in Germany--but we have been unable to locate a German patent for this year either. After extensive searching we have found only two patents for the WTP. Austrian patent 93959, filed 29 May 1921 and granted 8 March 1923, which covers the disconnector mechanism, but contains a patent drawing which shows the entire mechanism of the WTP. There should be a German patent corresponding to this Austrian patent, but we have been unable to locate it. German patent 370907, filed 9 June 1922 and granted 25 August 1923, which covers the cocking indicator mechanism of the WTP. The patent describes it as effectively a loaded chamber indicator. 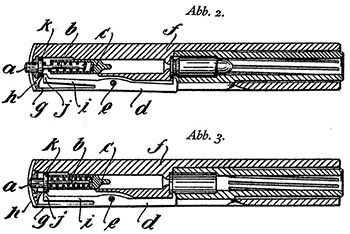 The guns illustrated in these patents are similar in outline to the unserialled prototype shown on page 147 of Mauser Pistolen and the serial number 1 prototype shown on page 148, which fortuitously has the date 1917 engraved on the slide. Neither of these two early prototypes features the cocking indicator which was patented in 1922. But if there were completed prototypes in 1917 , there were almost certainly patents filed in 1917 or 1918. We just haven’t located them yet. Until the advent of the WTP II, the gun was just called the WTP. Like most 6.35 mm pistols, the WTP is an unlocked breech design. It has a stirrup-shaped connector bar that runs on either side of the magazine well, providing a smooth, even trigger release. The lockwork mechanism is unique and interesting. The ejector moves up and down in the frame as the magazine is inserted or removed. 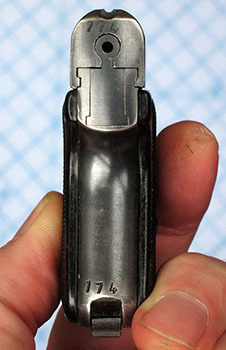 When the ejector moves down (which is necessary to allow the slide to move forward for removal from the frame during disassembly) its lower portion blocks the connector bar, preventing the gun from being fired with the magazine removed. The barrel has a large lug on the bottom. The front of the lug is drilled to accept the rear of the recoil spring and guide rod, and the bottom of the lug is drilled to accept the takedown catch, which holds the barrel in place in the frame. The cylindrical takedown catch has a cutout that allows the connector bar to move when the catch is up and the barrel is locked in place, but blocks the connector bar when the catch is down and the barrel is unlocked, thus preventing the gun from being fired when the barrel is not securely locked to the frame. The disconnector is a vertical piece that in its up position connects with the sear to allow the gun to be fired, but when depressed (when the slide is out of battery) disconnects from the sear and prevents the gun from being fired. The safety lever on the left side of the gun is positioned for easy use by the thumb of a right-handed shooter. When engaged it locks both the sear and the slide. At the back of the gun a single piece of spring steel serves three purposes. At the bottom it is formed into the magazine release. At the top it divides into two separate springs. The left spring tensions the ejector/magazine safety, and the right spring tensions the lower portion of the disconnector and hence also the trigger and trigger bar. Like the earlier pocket pistols, the Models 1910 and 1914, the grip frame is squared off and the one-piece grip fits over it (and the spring at the rear) to allow the hand to grasp the gun comfortably. Some early grips and special order grips are of checkered walnut, but the most commonly found grips are of checkered hard rubber with the Mauser powder barrel logo at the top. The extractor is a piece of spring steel that pivots on a pin. The rear portion of the extractor is bifurcated into two parts, one of which serves to lock the cocking indicator button at the rear of the slide when the striker is cocked. This button is not a visual indicator, as it always protrudes from the rear of the gun, but when the gun is cocked the button is locked and cannot be pressed in, whereas when the striker is not cocked the button is easily pressed flush with the rear of the slide. Hence, a quick press of the button will tell the shooter whether the gun is cocked. The WTP I is finished in a rust blue. The slide has eight flat-bottomed plunge milled serrations on either side. The top of the slide is grooved from front to rear, and tiny front and rear sights are set in the groove. The serial number is on the upper curve of the left side of the slide, just behind the front sight. Magazines are blued, with a flat rectangular base plate that has a small slot on one side where the bottom of the magazine spring fits to hold the plate in position. There are two vertical slots cut into the left side of the magazine for viewing cartridges. The magazine follower is designed with a flat back that locks the slide open when the last cartridge has been fired. However, the slide closes when the magazine is withdrawn. Variants of the WTP I are largely defined by slide inscription, with a few minor subvariants. This inscription includes only a “T” for “taschen” or pocket pistol, and no patent statement. The left side is unmarked, except for proofs. Many of these early guns were exported, as the market was limited inside Germany after the Great War. Guns marked for export are stamped “Germany” on the right side of the frame. W.T.P. - 6,35 - D.R.P.u.A.P. Pull the trigger and remove the magazine. Use the floorplate of the magazine to push in and pull down on the takedown catch. Push the barrel forward about 5 mm and lift it up and out of the slide. 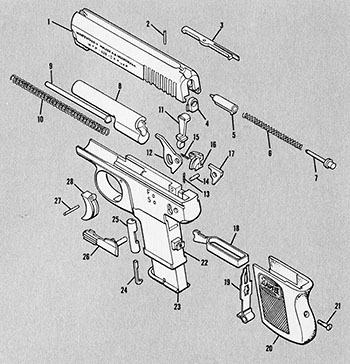 When reassembling the gun it may be necessary to depress the ejector and the disconnector in order to move the slide into position on the frame. * The grip tends to depress the spring which tensions the ejector, making it difficult to remove the slide. This can be remedied by removing the grip before field stripping the gun. If you do not remove the grip you must push the slide off against the pressure of the spring-loaded ejector. In 1937 or 1938 a completely redesigned version of the WTP was introduced as the WTP II. The new gun is a half-inch shorter and more than an ounce lighter than the old model. The barrel is about 4/10 of an inch shorter than the old model, and the barrel lug beneath the chamber is much smaller. The only design features retained from the old model are the takedown latch and the movable ejector that also serves as a magazine safety when the magazine is removed. The trigger bar runs on the right side of the pistol and the disconnector is an upward projection from it. The guide rod of the striker protrudes through a hole in the rear of the frame when the gun is cocked, providing both a visual and tactile indicator. The safety lever runs beneath the left grip and emerges just behind the trigger. The slide does not lock open when the last cartridge is fired. As on the earlier version, the top of the slide is grooved and has tiny sights milled into it. The blued magazine holds six cartridges and has five staggered witness holes on the left side only. The baseplate has a rounded front with a small slot on the left side where the bottom of the spring is inserted to retain the plate. The baseplate has the Mauser powder barrel logo stamped on it. The finish is salt blue or nickel. Grip plates are of checkered black or brown plastic, with the Mauser powder barrel logo at the top, and are made by Preßwerk A.G. of Kunstharzartikel, Essen. Brown grip plates are scarce. There are three main variants of the WTP II. Note that the “D.R.P.” abbreviation stands for “Deutches Reichs Patent” and does not include foreign patents. 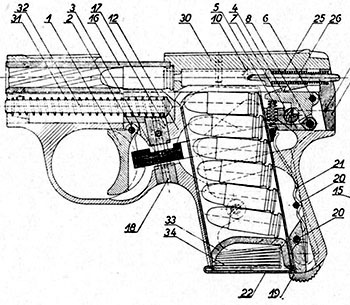 We are not certain exactly why Mauser was not claiming foreign patent rights for the WTP II. There are 17 fine triangular-cut serrations at the rear of the slide, angled slightly forward. W.T.P. - 6,35 - D.R.P. This variant is defined by its 11 broad triangular-cut slide serrations, angled slightly forward. This variant retains the slide inscription of the previous variant. The only two sub-variants are defined by the proof marks on the right side of the slide. The crown-over-crown-over-U commercial proof was used until mid-January 1940, when the Nazi eagle-over-N proof came into use. The eagle-over-N proof is found on the WTP II from serial number 75500-76700 approximately. According to Weaver, Speed, and Schmid, in their book Mauser Pistolen: “Mauser-Werke AG, Oberndorf was targeted and bombed by the Allies on February 22, 1945. Physical damage to the facility was considered light, but the attack did serve to cripple the firm’s power plant...” After the war, the Allied Powers agreed that all weapons facilities in Germany were to be demolished, but the French were desperate for weapons and their own infrastructure had been badly degraded, so they put the Mauser facility back into production through 1946, and even after that time , as they were shipping Mauser’s machinery back to France, some arms assembly continued into 1947. Vigorously push the slide forward and off the frame.